Total line length: 10.5 kms. existing and in use by Circumflegrea line. The stations inherited from Circumflegrea will be: Montesanto, Cilea (to create, connection to line 1-Cilea by lifts), Piave and Soccavo. Station Cilea is to be built and will be an interchange with Linea 1 by means of a system of lifts and escalators (the lines operate with a difference in height of 120 metres). Works have been approved on March 13 2001 (see news -in Italian- from La Repubblica, or news -in Italian- from Il Mattino). No news are currently available about its actual realization. existing and in use by Cumana line. The stations inherited from Cumana will be: Kennedy, Mostra, Fuorigrotta, Vittorio Emanuele and Montesanto. on December 19 2000 works started to create this new section and close the loop as shown in the map; tracks will be completely underground; first part between Soccavo and Monte SantAngelo is 1,5 km long, 35/40 meters in depth, cost 50 billion Lire, and should have opened by end 2003; second part between Monte SantAngelo and Kennedy is 2,5 km long and should have been completed by end 2004 together with the new stations Cinthia and Terracina; a further station has been planned in this section, Giochi del Mediterraneo, no news are currently available about its actual realization. Actually, there are delays in works on this section: as of May 2004 tunnel between Soccavo and MonteSantAngelo stations has been completed, and works are in progress for this latter station, under direction of Kapoor. Initial frequency will be 8 minutes. On September 5, 2001 a 266 billion Liras funding has been signed (see news - in Italian - from La Repubblica). Monte Sant’Angelo station Linea 7 is designed by Anish Kapoor. The artist was impressed by the huge hollow. There will also be a 40-metre well which will bring light to train platforms. Kapoor himself explains his credo: "It will be an artpiece which only by chance will be in a metro station. It will be a sculpture you will be able to get in. We wish that people can realize it is a subway, a journey through Dante Alighieri's world. Rather than being a light at the end of a cave, it is a travel to the end of a cave. If one realizes this, then the experience of passing by, of moving through, of travelling, can be art". Excerpt from a press release - in Italian - from Il Mattino. all photos © by Anish Kapoor and Future Systems, 2005. Photos taken by KultureFlash. Thanks to Gianluca Toscano. November 2, 2002: signed agreement between Regione Campania and Italian Government on a two billion euro basis: fundings, among other things, for completions of Linea1, Linea 6 and Linea 7 (see news 1 and news 2 - in Italian - from Il Mattino). November 4, 2002: more details on fundings (see news - in Italian - from Il Mattino). September 16, 2003: SEPSA Montesanto station (Linea 5 and Linea 7) will undergo restyling: works start at the end of September 2003 and should end in 2005 for a total cost of 40 million euros. A tunnel is being considered to connect this station with FS Montesanto station (Linea 2) (see news - in Italian - from Il Mattino). January 21, 2004: Comune di Napoli approves construction of a pedestrian underpass in Montesanto area between Linea 2 station and that of Linea 5 and Linea 7 (see news - in Italian - from Il Mattino). November 6, 2005: opening of station Monte Sant'Angelo (Linea 7) designed by Anish Kapoor is expected to take place in 2008 (see news - in Italian - from Il Mattino). 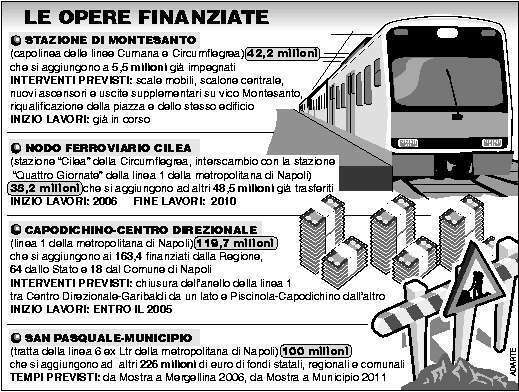 December 3, 2005: CIPE has funded 323 million euros for Naples metro works: 42.2 millions for Montesanto station (Linea 5 and Linea 7), 61.1 millions for Cilea - Quattro Giornate interchange node (Linea 1, Linea 5 and Linea 7) to complete by 2010, 119.7 millions for the section Capodichino - Centro Direzionale (Linea 1) and 100 millions for the section San Pasquale - Municipio (Linea 6) (see news and table - in Italian - from Il Mattino). More info: Regione Campania site. For details about trains and a picture of a Circumflegrea train click here.